A far better than average specimen of the remarkable Calcite in Clam shell fossil from the renowned Rucks pit. This was once a prolific small quarry and produced many of the Miocence age fossil Clams. Now closed to collecting and reportedly exhausted, this was a unique deposit. 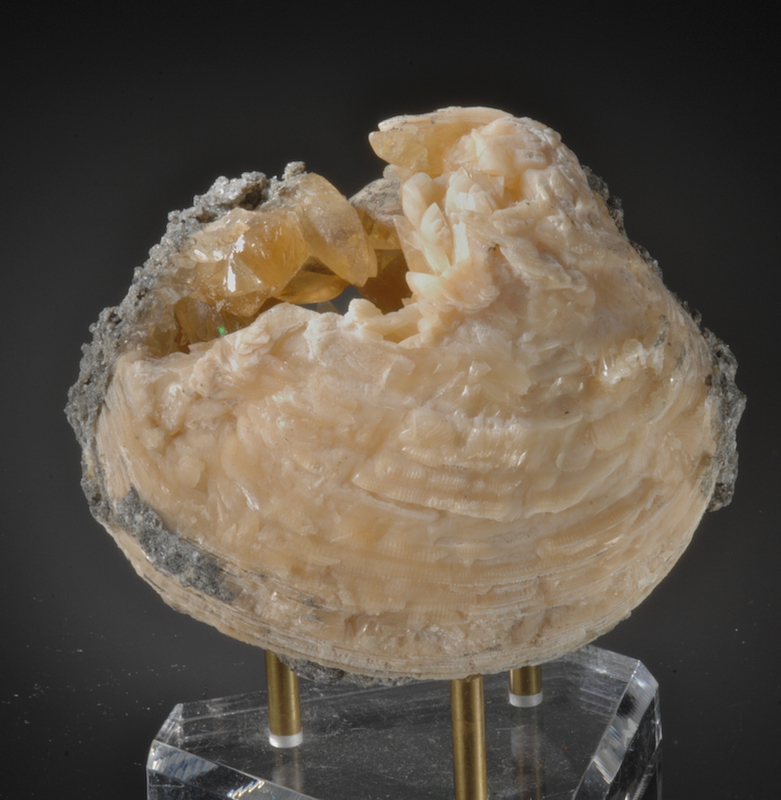 This example is a perfectly complete shell, well defined and showing the Clam exterior replaced by tiny Calcite crystals. The inner void is seen through an opening at the hinge and shows well formed gemmy amber color Calcite prisms to 3.1 CM long lining the inside. These were plentiful in the past, but fine, perfect examples like this were never common and are now especially desirable and rare. This is a choice Shullsburg Calcite with the classic stepped Scalenenohedral crystals that have enlarged clear prismatic terminations. Far more transparent in person this has glassy luster and faint phantoms of internal Pyrite crystals. In excellent condition the only damage is the base and back lower edge area where this was removed. A choice older specimen, these are modern classics and this is like a textbook example of epitaxial alignment of prism faces. 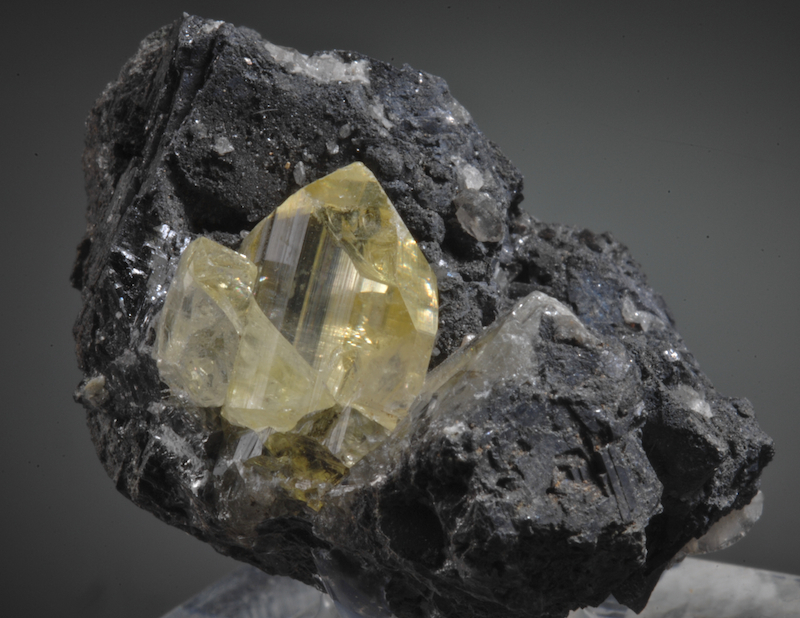 The type of Anglesite that is the most desirable from Touissit (or anyplace) are bright lemon yellow, gem clear prisms. This is a nice small specimen of that type, with fine color and contrast on the Galena matrix. There is a small chip on the largest crystal that is reflected in the price but this is not a big distraction. The clarity of the Anglesite is excellent, this is a facet quality crystal at a relatively affordable price. 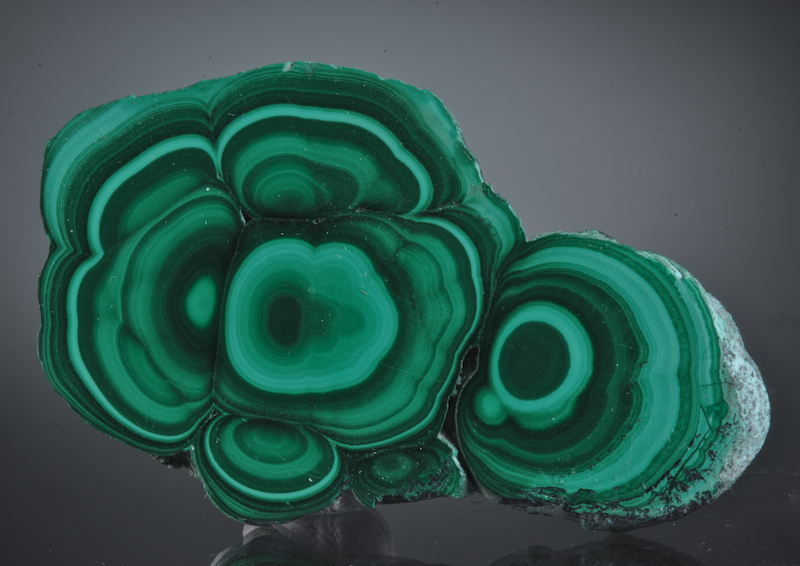 Sections of stalactitic Malachite can be quite esthetic, especially when the form is more complex and with good color banding. This is an excellent example cut from materials collected in the 1990s. This style is now becoming rare with the "cauliflower" form. Complete edge rind all around, and polished on both sides. 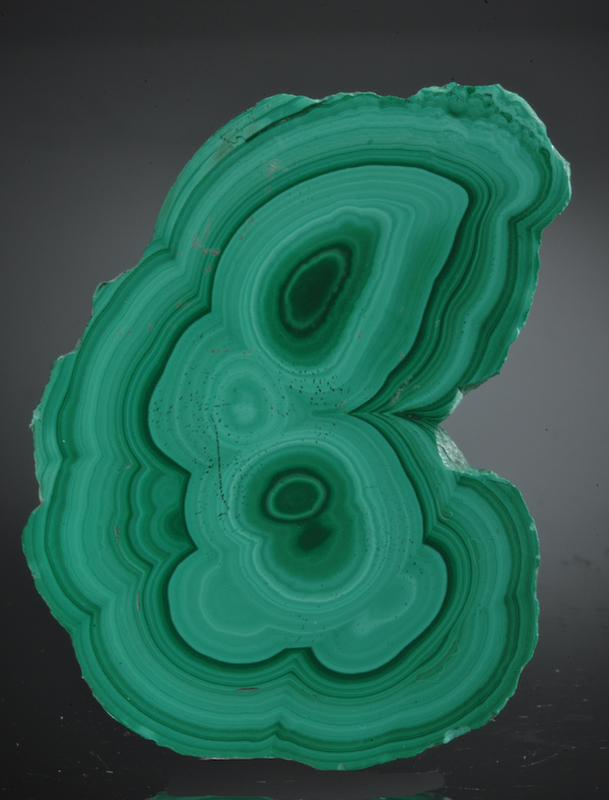 Sections of stalactitic Malachite can be quite esthetic, especially when the form is more complex and with good color banding. This is an excellent example cut from materials collected in the 1990s. Far better quality and form than average for this sort of slab. The double eye on this piece is especially striking. Polished on both sides but the "back" as seen was near to top knob of the malachite form and so has much more rind. Complete with great form and contrast. 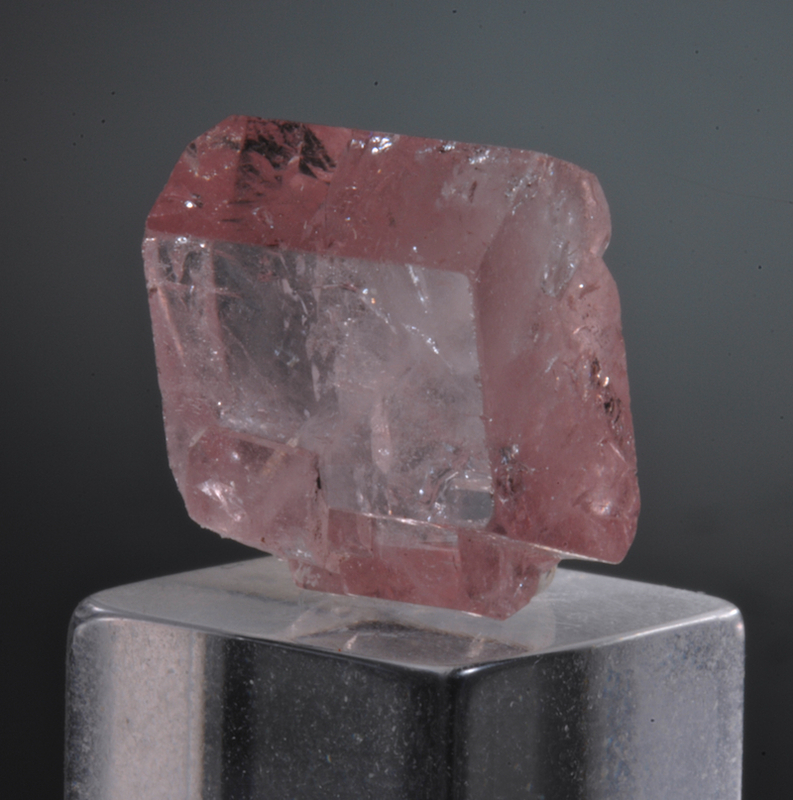 A small but incredible gem clear Apatite crystal with the desirable bright pink color. From the La Marina mine in the Emerald belt of Boyaca province that is known for world class Euclase. This has a thin white line inside much like a fadden string which has been noted rarely from this locale. 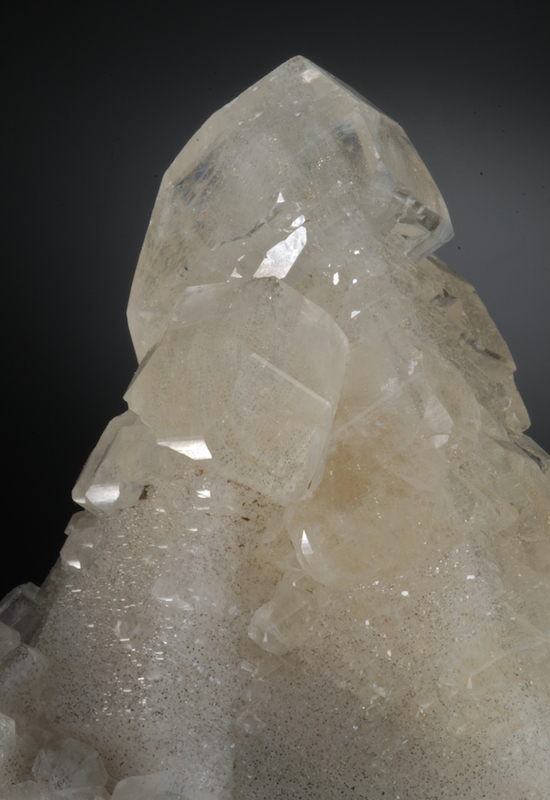 The crystals in the mine often have elongated or widened, distorted prisms, which is seen on this one as well. Very sharp, a very small chip is on one back edge but overall visually clean on the front display side. We visit Colombia several times each year looking for Apatites like this. The production is very sporadic and never large, some years none are seen. This is well above average for color, clarity, form and condition. Esthetic and not typical at all! 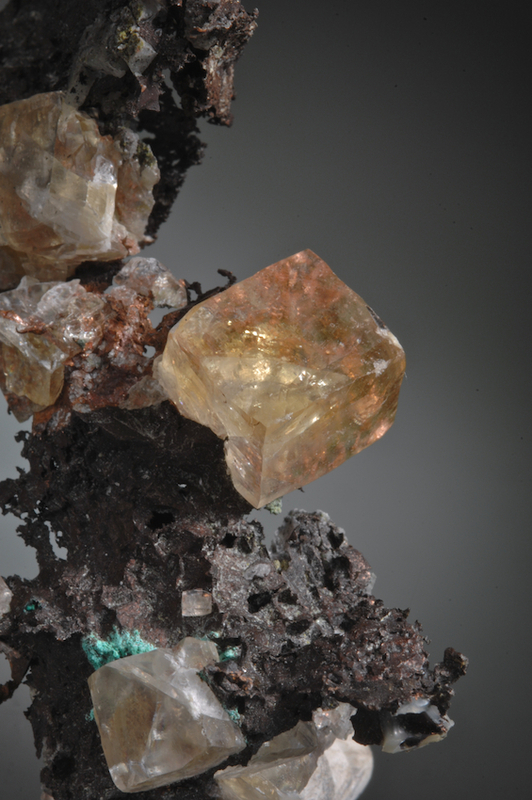 Native Copper in leafy tendrils holds and is inside very clear crystals of Calcite. The Calcite is in blocky cube forms with complex growth hills on some faces and colored by the inclusions a bright Copper hue. The Calcites are glassy and the whole composition is very attractive. Some contacts are noted mostly on the backside of the specimen, overall in fine condition. I have not seen another of this style in many years. 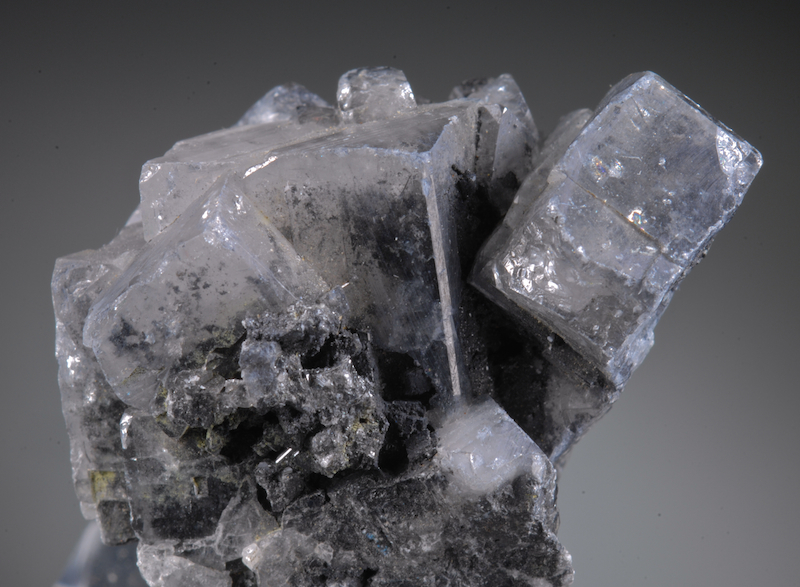 Blocky transparent crystals of white Anglesite with inclusions of Galena seen clearly inside. From the mines at Touissit, this is not the well known form, habit or color most often seen. The form is similar to some specimens from Sardinia or Tsumeb. The condition is good with very minor edge chipping on a few areas not very evident.